I used the recipe from Healthy Food Lazy People with a few tweaks, since I just happened to have a Jamie Oliver cookbook in from the library that explained the process more in depth. Here’s the original recipe with my changes added (I made a double recipe and the pictures are mine)…. 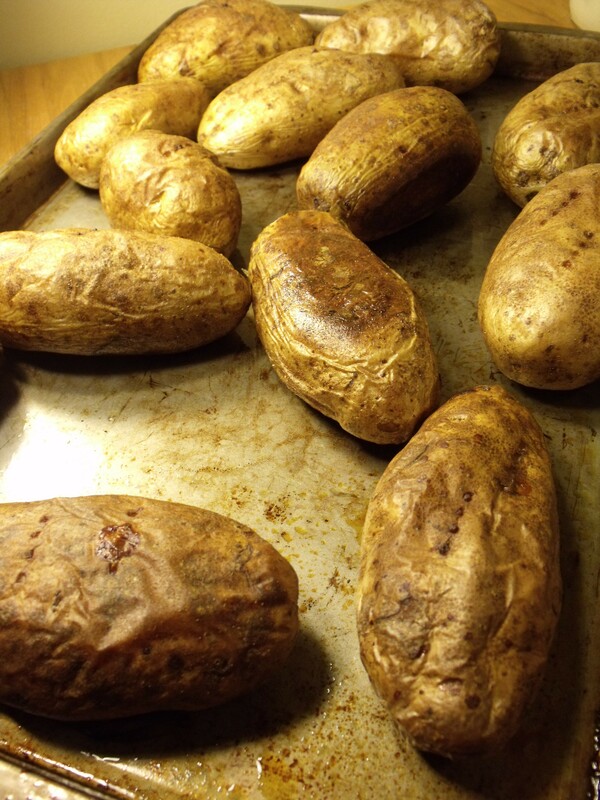 Step 1) Scrub the potatoes, put them in the pot, and bring to a boil for 30-40 minutes (or until you can easily stick a fork through them) I rubbed my potatoes with a little olive oil and baked them in the oven. According to Jamie Oliver, baking is the best method (if you have the time) because then there will not be very much water in the potatoes, which produces a lighter end product because you have to add less flour – makes sense. Step 2) While the potatoes are doing their thing, get your spinach ready. Remove any long, pokey stems (forgot to remove the stems, whoops! ), and bring a shallow pot of water to a boil. I used a deep pan and it worked just fine. 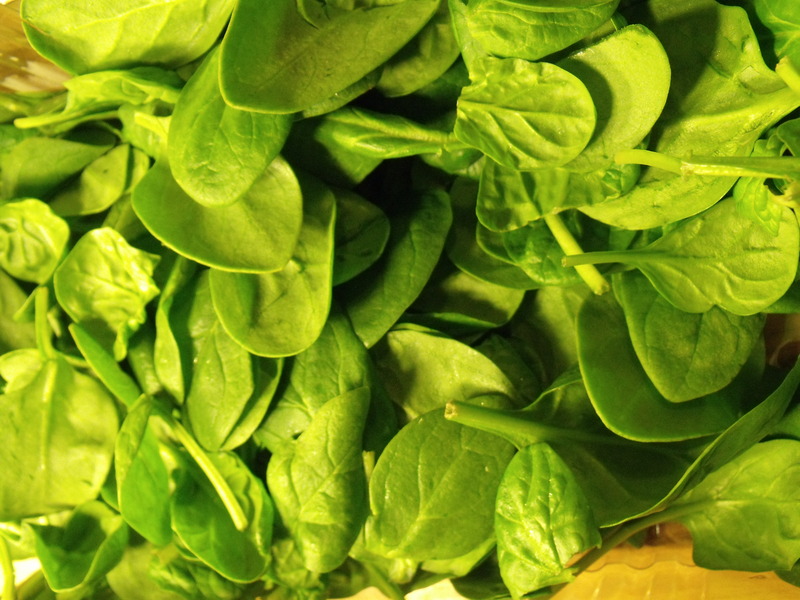 When the water reaches a boil, drop in your spinach for about 30 seconds, moving it slowly. I steamed the spinach in an effort for it to not be as watery, but later realized I was going to be using water to cool it off later, so that didn’t really work! 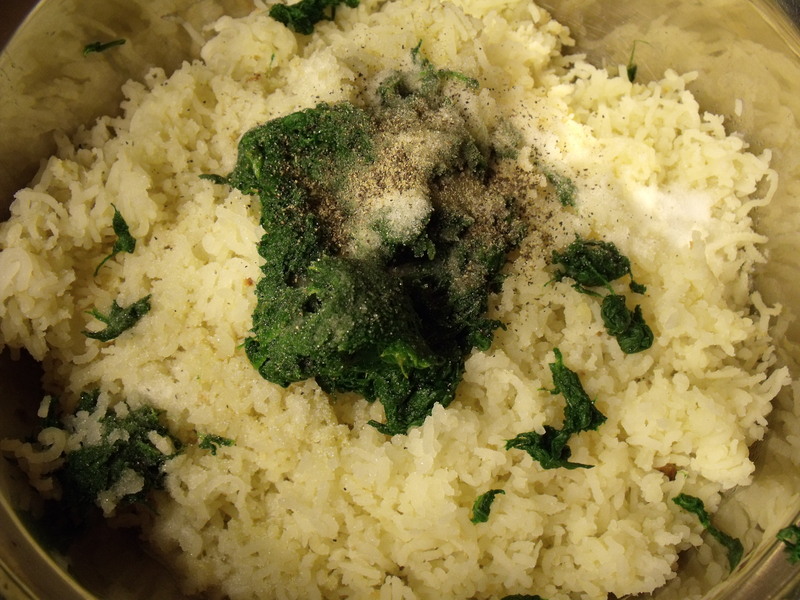 Step 3) When the thirty seconds is up, remove the spinach and toss in a bowl of ice water to stop the cooking. I just rinsed it with cold water. 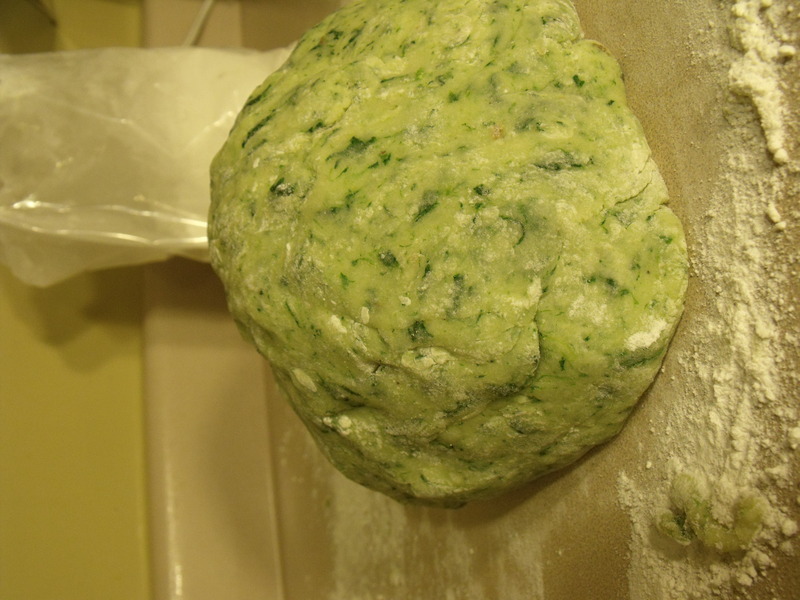 Step 4) Squeeze as much moisture as possible out of your spinach. Put in a food processor (I used my handy Magic Bullet) until pureed. If you’ve made good time, you can probably wash all those dishes and get them out of the way before it’s time to yank the potatoes. I had to use my Blendtec. And let me tell you, that blender can blend pretty much anything – but it is really lame as a substitute for a food processor. 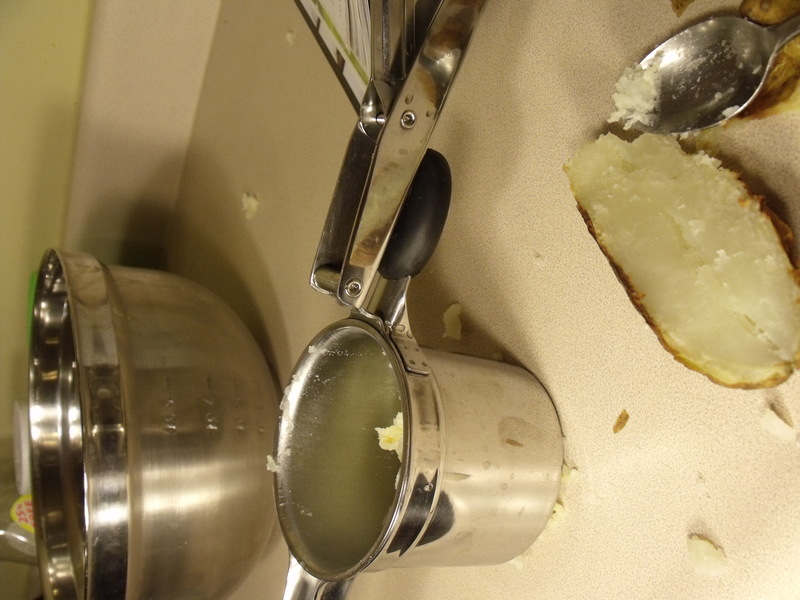 Step 5) When the potatoes are done, remove them from the water but don’t dump the water out (you’ll need it later). When you feel comfortable handling the hot potatoes, peel them. Step 6) If you have a ricer, push the potatoes through and go read a book. If you don’t (ahem, me), you’ll need to make do with a fork. It you slowly scrape the side of the fork down the potatoes, you’ll see they crumble into a light, fluffy pile. 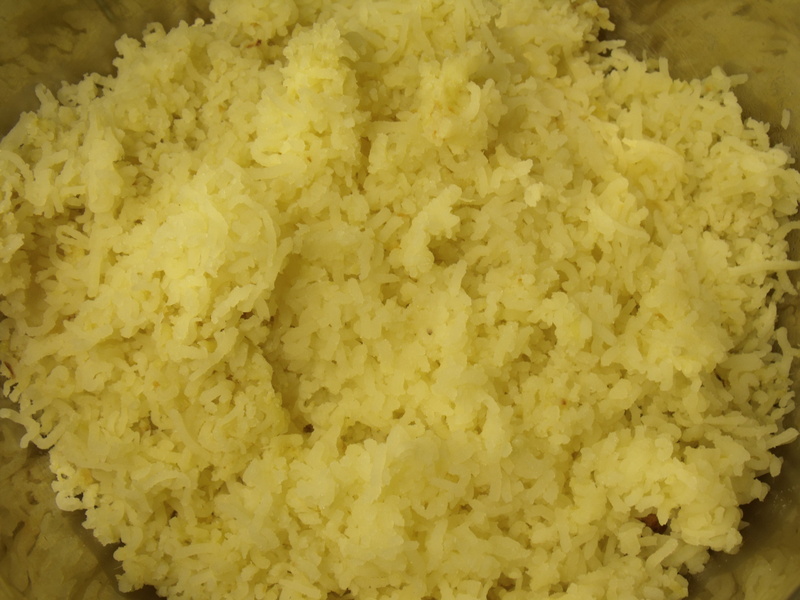 You don’t want to mash the potatoes, you want to lightly crumble them – this is important. The reason I finally worked up the nerve to try this recipe was because I swiped my mom’s potato ricer that she wasn’t using. It definitely made the process a lot quicker and easier than it would have been otherwise! Step 7) When all the potatoes are crumbled, pour yourself a glass of wine. Step 8 ) Slowly knead a cup of flour, one lightly beaten egg, and a tsp of salt. Work in more flour as needed (pun intended). I used about 1 1/2 cups total. A little stickiness is good, but it needs to be roll-able without sticking to your hands and the table. I used cake flour, which is just very fine regular flour – supposedly makes a lighter dough (Also less healthy, I know..). But, again, I’m just following the word of the man, Jamie Oliver. 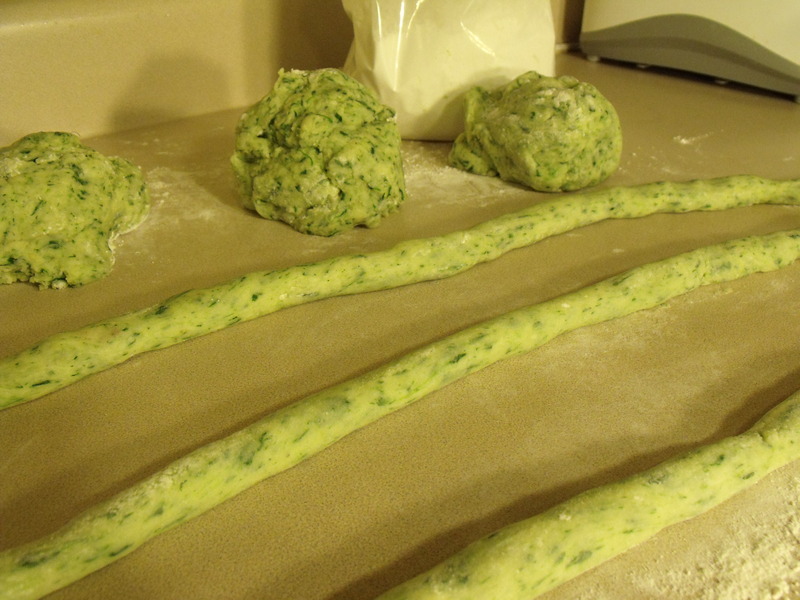 Step 9) When your dough is formed, roll it into finger-thick ropes on a floured surface. Using the side of the fork, cut the ropes into 3/4 inch segments and set aside. Step 10) Now that you, the floor, the counter, and the walls are covered in flour (yeah, that happens pretty much every time I use flour… I’m messy), it’s time to boil the gnocchi. Return the pot of potato water to a boil. Drop in 20 or so at a time, and let them boil until the rise. Remove them after floating for 30 seconds or so. 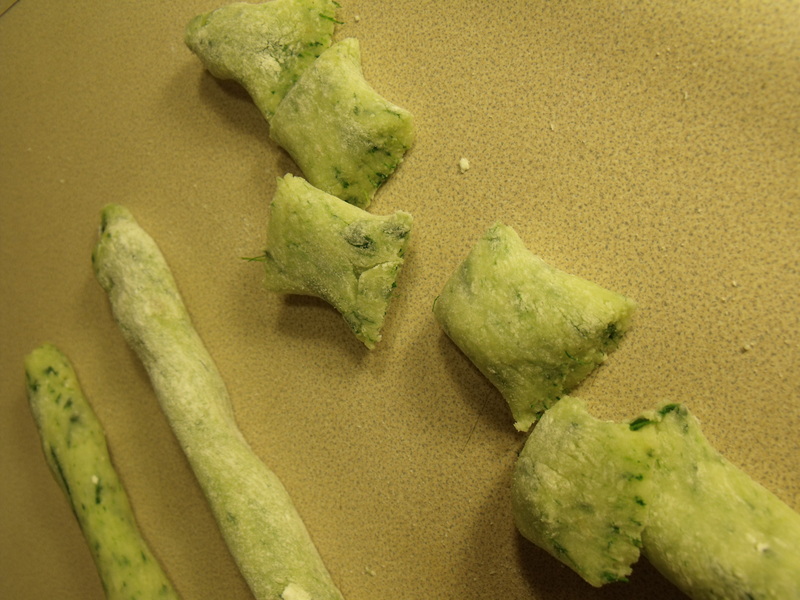 Step 11) Once all your gnocchi are out of the water, top with sauce and cheese and enjoy. Step 12) Don’t go back in to the kitchen until tomorrow. Sweet. Homemade Gnocchi, topped with homemade pasta sauce and served with glazed carrots and salad with homemade balsamic vinaigrette. They turned out fantastic and everyone loved them – but if I am being quite honest, I am not really that big a fan of potato dumpling type things (Pyrogi’s included), I much prefer regular flour dumplings. 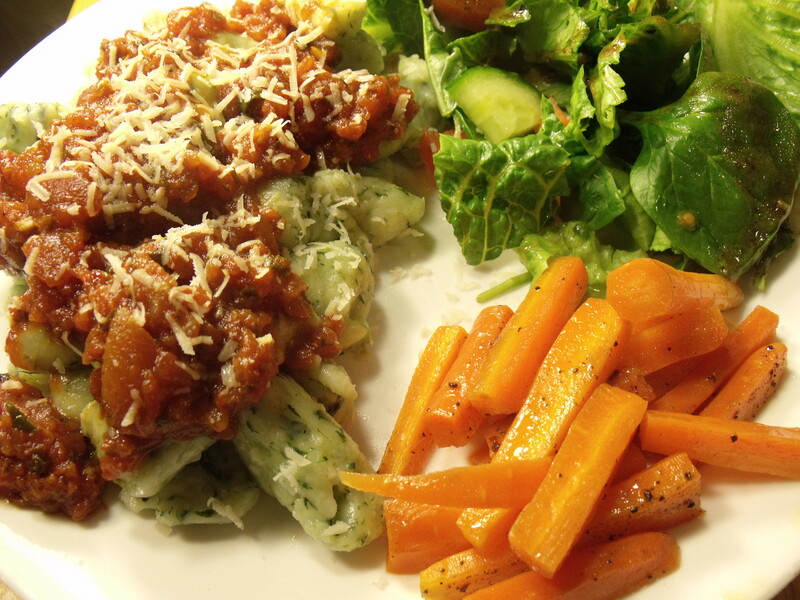 But don’t let my taste buds dissuade you from trying out this great recipe – thanks Healthy Food Lazy People! Glad you enjoyed the recipe! I had a lot of fun making them!